Is anyone travelling ? If staying home, what are you preparing for the holidays, Holy Thursday, Good Friday & Easter Sunday ? Other Holiday Celebrations ? Since I have one week off of work, I am taking a trip to lSLAS CIÉS (ferry), which are located off the Galician Coast of O´Grove and Toja, Galicia. ( north of Portugal on Atlantic Coast ) ..
Shall also be spending 2 days and 1 night in Santiago de Compostela .. And stopping for a wine tasting in Cambados .. At an Albariño (ancient grape variety indigenious to Cambados, Rias Baixas). That sounds like a great trip!! We’re not travelling, but Slavyanka would like to attempt to make her first Easter bread. Her mother always makes it and kicks everyone out of the kitchen until it’s done. Since she’s been in Canada Slavyanka has bought it from the church, where some ladies make extra. We’re having trouble sourcing a pan for it, but in the past her mother has used large tomato tins. Other problem is getting the right kind of baking paper to line the can. AFA dinner for Easter I was just talking to Slavyanka about that. I’m thinking of inviting friends from her church and doing a pork belly and brisket on the smoker. Trout fishing has just started with the spring thaw so I might get lucky and bring something home, too. Last year I had a nice 6 lb rainbow we did on the bbq. Don't know exactly which Easter bread you have in mind. But, in general, when baking in food cans, the traditional lining is either wax paper or heavily greased paper bags, cut to size. There's no reason I can think of that parchment paper wouldn't work just as well. BTW, an interesting "pan" for breads like that are terra cotta flower pots. Baby Octopus .. This is the land of shellfish & mollusks & finned fish ! Since I no longer eat red meat, my pescatarian diet is my main source of proteins. Galicia is also renowned for its special balnearios (hot springs) and spas .. As well as their amazing wines and liquors. It is simply enchanting and profoundly steeped in history dating back to the Celts, and for nature, there are Las Islas Ciés, and the Finisterre, the coast going north to Santiago .. The Galician Cheeses are another reason to travel to Galicia !!! And speaking of breads !! Well, your freshly caught wild trout sounds wonderful ..
As, I am a big city urbanist, we are not allowed by the Board of the Condominium to BBQ on our terraces ..
Have a lovely holiday just ahead. Yes, terracotta earthenware deep pots for plants could be a Marvel or Vulecos ( pitcher shaped cazuelas ) and of course Parchment paper as well ..
Have a nice break / holiday ahead. This is the bread they like to make, but more in an upright like a cake. I’ll suggest the clay pot to her, but she wants coloured paper to line it with. I know waxed or parchment paper will do but they’re too plain. Scald milk, let it cool some and remove skin. Mix yeast with warm milk. Melt butter and blend with oil. Add egg, oil & butter, sugar, cloves, salt, and pepper to milk and mix well. Add milk mixture to flour to form dough. Need dough for 25 to 30minutes. Put dough in a bowl and cover with a white towel. Let dough rise to double size. Grease bread pans with Crisco. After dough has doubled punch it down and proportion it out to the bread pans and fill just short of half full. Cover and let rise again to top of pans. Bake at 375* until done, about 20 to 25 minutes. This is a great yeasty bread with a soft crust and nice heavy crumb. It has a slight sweetness plus the clove and black pepper are there perfectly balanced. This bread is well worth all the work that goes into it. The smell of it baking is incredible and would humble most bakeries. One taste will transcend you back and tell you the story of the Czech immigrants. It is the soul of the Slovak culture. The recipe will scale down very easily, give it a try. Thanks for the link, wannabebwana. As I mentioned in my Portuguese thread, we don't care for heavily sweetened breads , so the chances are I won't make it. But it looks interesting. G-Man's Russian version is slightly less sweet, and would be a better possibility for us. However, to put it in perspective for most Americans, six pounds of flour is 21 cups. In other words, a heck of a large quantity. But it's easily modified to make a reasonable amount. I might give it a shot, sometime, when I'm finished with my new project, which will have me occupied for the next few months. Most bread-oriented cultures have at least one Easter bread in their repertories, especially those along the Med. Greece probably leads the pack with the number of them. Indeed, one could do a whole exploration of Easter breads if so inclined. This Russian Easter bread has a back story. Recipe, photo and story from a friend, Marvin Rodak. "In 1918 my Grandparents came to the US from Czechoslovakia. They processed through Ellis Island and settled in the upper part of NY near Syracuse. They were Russian Orthodox Catholics and spoke Russian until he learned English. With them they brought a wealth of culture and tradition. The Russian Easter bread was only a small part of the traditional Easter food prepared. 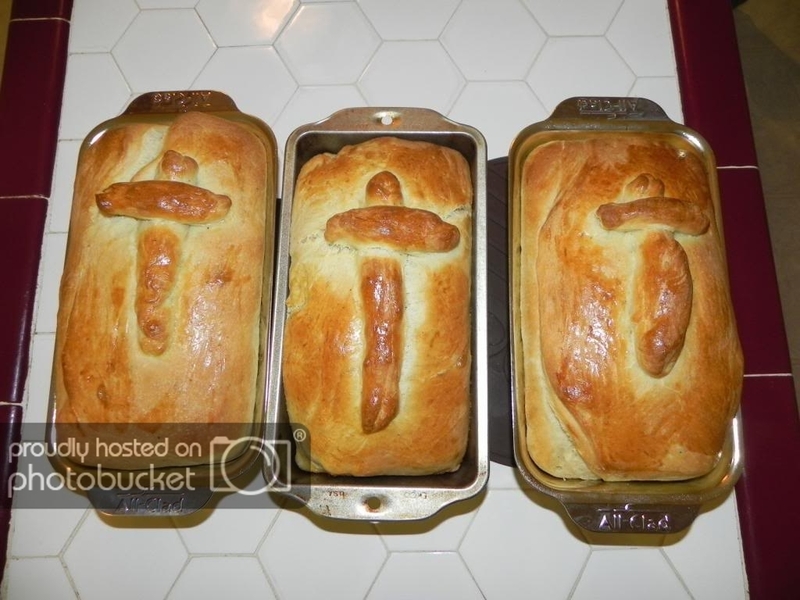 Crosses were put on the bread. A food basket was prepared and the Priest would stop by on Easter and bless the food plus have a drink. I remember they cooked all week getting ready for Easter. They made several kinds pierogies, keilbasa, beets & horseradish, potatoes with onions, ham, salads, cheeses, and deserts. The family was very large, I have 13 Aunts & Uncles, so a large volume of food was prepared." I'll probably do a double-smoked ham with the usual trimmings, and then settle in to watch my favorite golf tournament of the year....the Masters, from beautiful Augusta National. 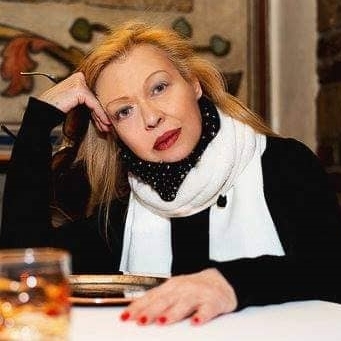 Gracoman, that sounds exactly like what happens with Slavyanka's Russian Orthodox church, only the priest doesn't come by the house, they all take their baskets to church for the Easter midnight mass and they're blessed after. I found my favourite brand of vodka that way. Someone had a bottle in their Easter basket to be blessed. It's a local craft vodka, but if you ever get the chance to try it, you won't be disappointed. Best wishes and the best of health. 9 tablesp. of sugar sounds like alot, however, it is subjective ..
Have a lovely holiday ..
On average, a typical loaf of bread uses 4 cups of flour. So we're talking about 5 loaves minimum. Divide that into 9 and we're talking less than two tablespoons per. If the recipe actually produces the 7-8 loaves claimed, then it's a hair more than 1 tablespoon per. Not a lot of sugar at all. Thing to keep in mind, as I've said more than once: If you spread water thin enough, nobody gets wet. BTW, nothing about bread baking is subjective. While a pinch of this and a handful of that works just fine for cooking, baking is more precise. Not, perhaps, as scientifically accurate as some would have it, but close. Start arbitrarily changing ingredient amounts and its easy to come a cropper.